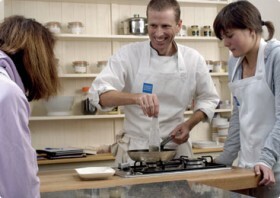 Basic ingredients: One of the UK’s leading cookery schools, Ashburton offers more than 40 cookery courses from beginners to advanced cooks, and from Taste of the West Country, to tapas and gluten-free courses. One, two and five-day residential courses as well as a 20-day diploma are taught by Chef Tutors, mixing demonstrations with hands-on practice. Each student is allocated his or her own cook station. We say: Friendly, fresh approach and inspired cooking that’s strong on fundamental techniques is the sort of feedback that we hear regularly about Ashburton. Do you run cookery courses for children? I have a very enthusiastic cook of 12 yrs but most of the kids courses I find are for cup cake making or quite basic things. Was trying to find something in the middle that would challenge him but also be age appropriate. Do you have any advice or can point me in the right direction? We are based near Glastonbury, Somerset. Hi Kate, children’s cookery courses are booming (see our article in the Daily Mail) and more schools are offering them, especially in the form of parties or cookery clubs during the holidays. If anyone is still on the look out for fun cookery classes specifically tailored for those between the ages of 8 -14 years we offer such an all day course in Exeter, Devon during the holidays called ‘Fun Kitchen’. Hope this might help. This a great, inspirational cookery school. I am a very keen amateur cook and have now done a series of courses at Ashburton, culminating with the Advanced Chef Skills Plus weekend course. They were fully booked with 16 students. A couple of months ago I thought I would have struggled on this course, but I got through it with ease and thoroughly enjoyed it. All the chefs have a real background in great kitchens, including some Michelin starred establishments. Their knowledge of the real world of kitchens is outstanding, and their tips and tricks are freely shared in an entertaining way. Loads of banter! I now have a sheaf of notes which form a sizeable book of recipes, all of which I have tried and tested. I have been exposed to so many new flavours and techniques. My wife and I have bought a tea shop, and I now plan to upgrade our lunch offerings considerably.